Upper School students are challenged at each grade level with a range of courses, including Language Arts (English), Mathematics, Science, Social Studies, Foreign Languages, Religious Studies, and Physical Education. Additionally, courses may differ in subject, theme, or level of difficulty, each year. 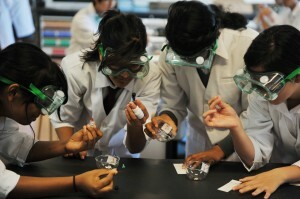 For example, Science courses include Physics, Biology, Chemistry, Earth Science, and Science in Society. Elective classes include Art, Music, Symphonic Band, Business, Japanese History, Marketing, Law, Digital Design, and Photography. In grades 11 and 12, eleven college-level Advanced Placement (AP) courses are on offer – these rigorous and highly demanding courses offer an excellent foundation for future studies.